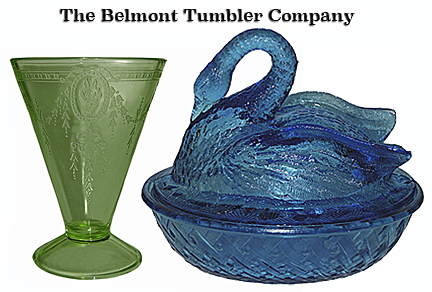 The Belmont Tumbler Company is a little known glass company that was located in Bellaire, Ohio. This company was destroyed in 1952 when a fire burned the factory to the ground along with all the company records. The Depression Era patterns that this company is most noted for are Rose Cameo and Bowknot. Pieces of Belmont production can be found in iridescent amber, green, pink, and crystal.